her house rent is concerned. The songstress who has been given quick notice for not paying her home rent over the most recent a half year as now been sued to court. Saturday Beats exclusively obtained court documents showing that Cynthia Morgan has been charged to the Ikeja High Court for failure to pay her rent at her Omole apartment. Sadly, it was learnt that on the same day the artiste was served court papers for defaulting on payment of rent, she was also served with court papers for evading tax. 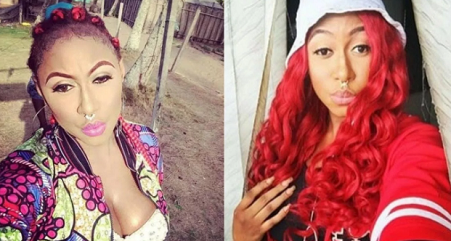 A source close to the owner of the apartment where Cynthia Morgan currently lives told Saturday Beats the amount she owed, which tallies with the information on the court papers obtained by Saturday Beats. The source added that the singer’s brother has been begging the owner of the apartment for further grace period even though the initial six months grace given to the artiste ended last month. “Ever since she moved into the apartment as a tenant, the owner of the building has described her as a nightmare. She has since been given quit notice. At a point, the owner of the house didn’t even know who was staying in the flat because every day, new faces showed up at the apartment and they would leave the gate open at odd hours. Young scary looking boys with different hair colours come around and they smoke in the compound. “They disturb the nice couple living in the flat upstairs, who have been complaining that they can’t even let their kids play in the compound because of the type of people they see around. She has owed waste bills for over a year. They always play loud music at odd hours of the day. Funnily enough, the couple who live upstairs are also popular; the man is a very popular celebrity designer but I would not want to mention his name. His wife always complains that her home help sweeps cigarette butts everywhere all the time. “Cynthia Morgan decided at a point that she was going to be recording in her room. When the noise was too much, the owner of the house had to talk to her about it. She has been given quit notice. The six months grace period is up and she was meant to have moved out last month. She is flat broke. They have been pleading that they don’t have anywhere to move to neither can they come up with the rent. But it’s her brother that has been speaking on her behalf. We haven’t seen or heard from her but he claims she is always locked up in her room. “The court papers have been submitted to Cynthia Morgan’s apartment already and she has been served a court date. She owes N1.3m. According to her elder brother, she is in the house. She was also served court papers for not paying up to N3.584m in tax. It was the agent that sued her on behalf of his client. He is a very popular real estate agent; he is like a celebrity estate agent. He’s the one that gets apartments for most of them,” the source said.